Showcasing activist farmers, students, artists, and leaders in the local Slow Food movement, the film looks at how the Burkinabé people are reclaiming their land and defending their traditions against the encroachment of corporate agribusiness. The director, Iara Lee, is an activist, filmmaker, and founder/director of the Cultures of Resistance Network, an organization that promotes global solidarity and connects and supports agitators, educators, farmers, and artists to build a more just and peaceful world through creative resistance and nonviolent action! As a filmmaker, Iara has directed/produced several full-length documentaries and dozens of short films over the past decade, winning numerous awards. The filmmaker, who has been involved with Slow Food since 2004, has supported the “10,000 gardens in Africa” project and closely follows activities on the continent. Following the 2014 insurrections in Burkina Faso, Iara Lee wanted to follow the activism of the Slow Food network on these territories in the name of food sovereignty. From his trip in October 2016, two films were born: Burkinabè Rising, showcases resistance movements in Burkina Faso, and Burkinabè Bounty, which will be released at the end of May 2018. The director answered some questions from our editorial staff about the latter. SF: What is your link with Slow Food? IL: I have been a supporter of Slow Food for more than a decade. In particular, my foundation, the Cultures of Resistance Network, has long taken a specific interest in Slow Food movements in Africa. Often, when people think about Slow Food, they think about people in wealthy countries enjoying elaborate meals in expensive restaurants. But Slow Food’s work in Africa has shown that this is really a grassroots movement. Slow Food is about people fighting for food sovereignty, defending local food traditions, pushing back against industrial agriculture, and taking an agro-ecological approach. For me, the Slow Food movement is an example of the exciting work going on in the global South that really has the power to reorient the way that we think about this whole issue. In Burkina Faso, the food resistance movement is incredibly vibrant and strong. They stand up against the abuse of industrial agriculture, and instead of surrendering, they present living alternatives—a different way of growing food and nourishing their communities. It gives me hope that people in other parts of the world will follow the example of the Burkinabè movement and begin using art to promote agroecology and food justice and sovereignty in their own countries. Burkinabè Bounty is the second film I am doing about Burkina Faso. I just released another film called Burkinabè Rising that is about the art and creative resistance that emerged in the wake of the 2014 popular uprising in the country that unseated a dictator who had been in power for 27 years. It is a powerful story that I think has lessons for people struggling for genuine democracy all over the world. I wanted to make this second film because it was clear to me that food is an important part of that same culture of resistance. It is an aspect of this struggle that deserves its own attention. What did you find within Slow Food communities in Burkina Faso? From women gaining economic independence by selling artisanal “dolo” beer, to youth marching in the streets against companies like Monsanto, to hip-hop musicians setting up their own farms and reviving the revolutionary spirit of Thomas Sankara through their music, Burkinabè Bounty shows the creative tactics communities are using to take back control of their food, seeds, and future. 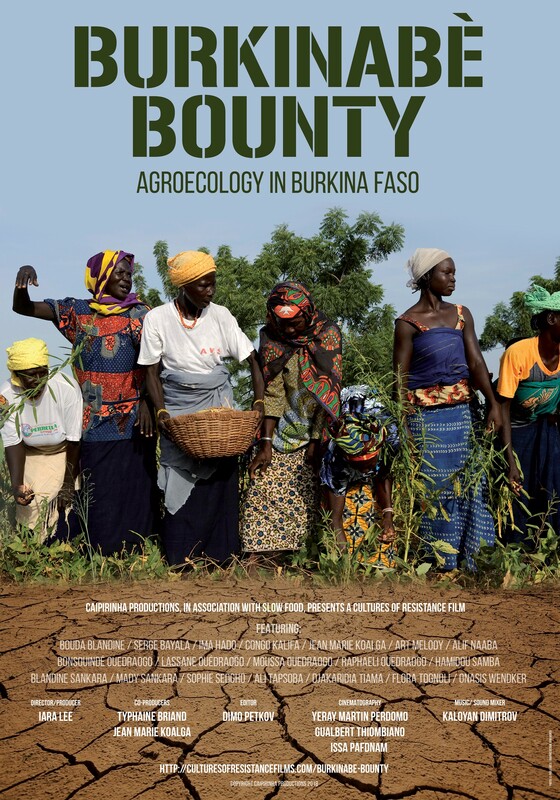 The Burkinabè farmers featured in the documentary believe strongly that agroecology can feed the world and allow people to live in good health and with dignity.